Thank you for visiting our site and we hope you will choose us for your dental care needs. Our office is designed for your comfort and our trained professional staff works as a team to make your visit pleasant. Geeta Puthalpet D.M.D. provides experienced, quality family dental care, including cosmetic, periodontal, and implant dentistry. Our staff has been selected for their caring, friendly attitudes as well as their highly qualified technical skills. We understand the needs of our patients and take great pride in our work. A further assurance that you will receive quality care is the commitment by every one of our practitioners to continuing education. We are always aware of and are trained in the latest advancements to deliver the best dental care to you. As a new patient, we will develop a complete picture of your present oral health. We will ask for your dental and medical history. The first visit will include a cleaning and x-rays by the hygienist. The dentist will then provide a complete oral health evaluation, checking for decay, oral cancer and gum/bone disease. Digital x-rays will identify hidden problems. This information will guide us in planning your treatment. In most cases, treatment will begin at the follow-up visit. We are a modern office offering gentle, compassionate, high quality dentistry for the entire family. We take pride in our ability to provide the finest dental care for our patients. We see all patients on an appointment basis. We respect your time and make every effort to remain on schedule, and ask that you extend the same courtesy to us. If you are unable to keep a scheduled appointment, a 24-hour cancellation notice is appreciated. Payment is due in full at each visit. For your convenience we accept Visa, MasterCard, Discover, American Express, checks, cash and Care Credit. Care Credit is the monthly payment plan we offer as a separate line of credit to cover health care needs. Please ask for information. For our patients over age 65, we offer a senior courtesy discount. We are grateful for the trust you placed in us when you chose us to provide your dental care. Please let us know if we can better serve you. Suggestions are always welcome. We advise waiting until local anesthesia wears off before eating. For silver fillings, do not chew on the newly filled tooth for 24 hours. Occasionally, sensitivity to hot and cold foods may be experienced for a few weeks after a filling has been placed, but gradually subside. Once the local anesthesia wears off, your bite may feel unusual and may need an adjustment. Please call for a brief appointment. Always call us if you have any questions or concerns after a procedure. Sensitivity to hot and cold and soreness of the gum around the tooth is to be expected after a crown appointment. Avoid sticky or crunchy foods while wearing the temporary crown. Avoid also vigorous flossing of the area. If the temporary crown falls off, please contact our office right away for a brief re-cementation appointment. This will prevent discomfort and unnecessary movement of teeth. Once the permanent crown has been cemented, the sensitivity in the tooth will subside. Sore spots may develop along the denture borders or any other area. This suggests that the denture might need some adjustments. Please call our office for an appointment. It is common to to need minor adjustments when you first get your partial or complete denture. After an extraction, there should be no strenuous or physical activity for the rest of the day. Refrain from rinsing, spitting, smoking and drinking alcohol for the first 24 hours. Diet should consist of cool, soft foods for a week after the surgery. Avoid foods that are hot, hard, spicy or acidic. Do not use a straw when drinking. Continue to clean all of your other teeth as usual. Keep the surgical area as clean as possible. Begin rinsing with warm salt water two days after the extraction. You can expect some tenderness, tooth sensitivity and slight bleeding. If you experience bleeding, wash your hands thoroughly with soap and water, apply direct pressure to the area for 10 to 15 minutes. Do not spit or rinse. To reduce any post-operative swelling, place an ice pack on the face for 20 minutes, alternating off and on. 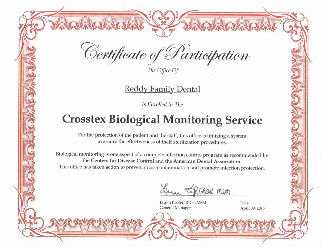 All the products used at Reddy Family Dental are EPA/FDA compliant. In health-care settings, the Environmental Protection Agency regulates disinfectants that are used on housekeeping and clinical contact surfaces, and the Federal Drug Administration regulates liquid chemical sterilizes and/or high-level disinfectants used on critical and semi-critical patient-care devices. The Center for Disease Control requires proper immunizations for professional staff and personnel in dental settings. Reddy Family Dental is in complete compliance with these regulations. Reddy Family Dental follows all guidelines for sterilization and disinfecting as recommended by Center for Disease Control. We use the latest industry standard autoclaves for our instrument sterilization. Daily testing of the sterilization process is conducted and recorded for patient safety.